I've seen this dang ad all around town and it drives me nuts for a myriad of reasons. I've discussed it in German class, with my tandem partner, and even with a new acquaintance. It's one of those "close, but no cigar" cases - but in this example, it's more like "close, but no cigarette!" 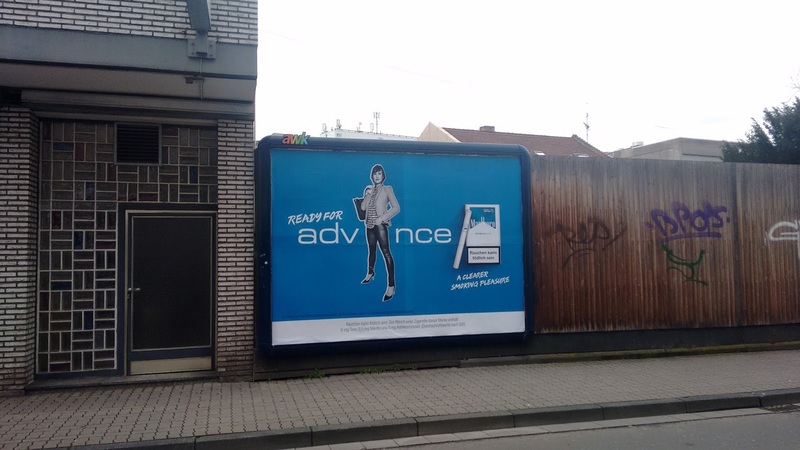 The tag line is "ready for advance." Uh, that's not the correct preposition. One can say "ready for advancement," "ready to advance," or "ready for an advance." Well, the last one really only works in the form of something like an advance of pay, which wouldn't necessarily make sense in this example. Either way, the ad company would have benefited from running this by a native speaker of English. It's such a small nuance in this case to find the correct phrasing. Oh, and as far as what the ad is hinting at, I have to say: really, people! Smoking will probably not advance one's career. If anything, it might shorten it. I was going to say that the ad company probably _did_ run it past native English speakers - ones who don't actually know or care about proper language usage.